... u Dr. Busuttil ma rrizenjax. In the area of trade with EU countries we have given up our right to decide that, for instance, a particular product should not be imported into Malta or should be subject to taxes upon importation or should be imported in small quantities. We can no longer do this. In this respect, our decision to join the EU and give up this right has exposed our local enterprises, across the whole spectrum of our economy, to the competitive forces of an open market. … in the area of trade with EU countries we can say that we have given up part of our sovereignty to decide for ourselves on our own. … No, we will not be the ones with the greatest say. L-ewwel Simon Busuttil kien kontra z-zieda fil-paga minima, imbaghad ghax Joseph Muscat wera li hu favur zieda, Simon Busuttil qal li hu favur. Meta kien Kap taċ-Ċentru Informazzjoni tal-Unjoni Ewropea, Simon Busuttil, kellu każ fejn ma setax isib parkeġġ u għalhekk ipparkja ħażin il-karozza li kien qed jikrilu l-gvern. Dan wassal biex qala’ ċitazzjoni mingħand gwardjan lokali li kien qed idur il-Belt. Iżda, dak li llum huwa Kap tal-Oppożizzjoni insista li €23 multa ma jħallashiex. In a public meeting in Vittoriosa last Sunday, he urged the Attorney General to “publish all reports” related to Mr Schembri and his accountant, Brian Tonna. Technically, Simon Busuttil was asking the Attorney General to break the law twice – first by getting a copy of the report and then by publishing it. … To attack the Attorney General and expect him to break the law, however, is not on. … the PN’s personal attack on the Attorney General is nothing short of obnoxious. Dr Busuttil didn’t really have an overall strategy. He was caught completely off guard at one point, when the PM asked him a question. Dr Busuttil was in a world of his own and was prompted by the moderator to answer the question. He very clearly had no clue as to what it was and he said he would answer later, which he didn’t. The PN has struggled to reinvent itself since the leadership changed, and saw Simon Busuttil take over the helm from stalwart former leader Lawrence Gonzi. The new PN leader fails the ‘blink test’ – not enough people can close their eyes and imagine him at Castille, including the staunchest of his supporters. Dr Busuttil may be right but he has not much to be proud of either. His reaction to the decision to postpone the matter (fish farm pollution) was that it was “fair enough”, that it was now up to the industry to prove itself and that the employees should be relieved. It was a shocking stand to take considering that, just a few months ago, his party put the environment, not business, at the top of its agenda. Busuttil’s propensity to walk straight into loaded Labour traps is worrying. Dr Busuttil, in an attempt to reposition the PN to the centre, came out lambasting the government for not doing enough for low-income workers. But, in the meantime, he failed to come up with tangible solutions. The Leader of the Opposition, who tried his best but failed to convince us all that his party was never against lowering energy tariffs. Simon Busuttil has made great strides forward in his leadership skills since taking over the party’s reins, but is still not perceived by many, including PN supporters, as being bold enough. Salvu Mallia, often described as the PN’s “star candidate”, lashed out at the Labour Party and hurled abuse at its supporters using colourful and even foul language. As expected, his outburst raised eyebrows within the PN, including among high-ranking officials. Yet, the PN, and, particularly, its leader, Simon Busuttil, appear too reluctant to take a stand, giving rise to concerns from within of a “weak” leadership. Is it possible Dr Busuttil is happy with the situation? Does he not realise the longer he decides to do something about it the more the damage he would be causing to himself and to his party? Is he resigned to share the same fate as his predecessor who appeared too weak to tackle a vociferous MP? We cannot say because he prefers to remain mum. His silence speaks volumes; more so his inaction. There is more that Dr Busuttil and the PN must deal with if they are to be believed they truly want good governance and clean politics. … The buck must stop somewhere and somebody must carry the can. Dr Busuttil readily admits he has a hill to climb and has to do that very fast. But, suddenly, he’s climbing it backwards. He has to watch his back. Possibly more than ever before, Dr Busuttil is realising what hurdles he has to overcome to deliver his promise of good governance. Last weekend, bang in the middle of a much-needed financial campaign, he had the carpet pulled right from underneath him in an unprecedented assault from a developer of the former ITS site in Paceville. … It is useless for the PN to argue that the Labour Party is in the pockets of big business. Big business has spoken and it is pointing at the PN and not at Labour. The PN has let it down and it now faces its wrath. Unfortunately, how he got into this whole mess (skandlu db group/PN) in the first place and how he allowed his party to be exposed to potential blackmail, is still not clear. The PN leader accused the government of leaving the infrastructure “to crumble” while squandering taxpayers’ money on nepotism. While that statement is somewhat of an exaggeration. In a comment beneath her Facebook post, Dr Farrugia added that the Democratic Party could “teach him [Busuttil] anything he doesn’t yet know”. Simon Busuttil cannot afford to face the electorate with half-baked proposals or pies in the sky. He cannot falter in front of journalists who rightly demand to see the beef of any proposal dished out in the haste of the campaign. A typical example is the populist (or maybe not so populist, considering that very few will benefit from it) proposal to give €10,000 to young couples who decide to settle in Gozo. Asked how this proposal will work, Dr Busuttil was lost in translation and didn’t provide a credible answer. Instead he told the journalists that his job is to roll out ideas and beef them up later. Wrong, Mr Opposition Leader. This country has had enough white elephants and fancy presentations that lead to nowhere. If there was one thing which helped Konrad Mizzi gain credibility during the 2013 election campaign it was the level of detail he gave regarding the new power station. … Dr Busuttil cannot be taken seriously that he can give €10,000 to young couples settling in Gozo because he doesn’t seem to know how to deliver his promise. Simon Busuttil’s immediate response to my offer was that since I was somehow associated with the defeated PN and its past I had become, and I quote, “a liability” to the party. Not quite. My political soul was moulded in the Eddie Fenech Adami era. It was a time when the buck always stopped at the party leader’s desk. If Simon Busuttil believed that I had become a liability to the new PN he wanted to create, the only gentlemanly response was to respect the decision with magnanimity and a dignified silence. In other words, it was not Joseph Muscat who bought my silence, but Simon Busuttil who banished me to it. … The Nationalist Party was part of my very identity and having its leader eject me put that identity into question. It was like being thrown out of the home I was born in, and for doing nothing worse than fiercely defending it till the end. With that one word from Simon Busuttil I instantly felt detached, disengaged from what was going on around me in politics and the media. … I never wanted this matter to be instrumentalised for political reasons, by either side of the spectrum. So I waited for the right moment. Now that the election is over and Simon Busuttil has resigned it is time to set the record straight and clear my name once and for all. I spoke to Simon Busuttil two or three times about my situation. He promised to do something about it but he did not. Simon Busuttil must go, at least for the sake of his party. My party, the one I militated in for some 15 years. The one I always voted for and the one I canvassed for in the last general election. … Busuttil must go for a hundred and one reasons. … Busuttil was elected leader of the Opposition in 2013. Since then he always trailed behind Joseph Muscat in every opinion poll I saw by some 10 to 15 points. People trusted, and still trust, Muscat more than they trust Busuttil. … Unfortunately for Busuttil, the perception out there is that he is not electable as a prime minister. … In most opinion polls I followed throughout these four years, Busuttil was even less popular then his own party. This poses a real problem, as it puts him as a liability to the party rather than as an asset. And let’s face it, there were instances when he really was a liability to his party. He was definitely a liability to the PN when he handpicked Rosette Thake for secretary general of the PN and also when he, unilaterally, approved Salvu Mallia as a general election candidate … He was definitely a liability when he burdened the PN with a coalition that only served to widen the gap between the PL and the PN with the result that the PN ended up with one seat less in Parliament. … the PN was caught on the wrong foot when the election was announced, that there was no electoral manifesto ready, not even a draft and that the very few last minute proposals were half-baked. Newly-elected PN MP Therese Comodini Cachia has admitted that outgoing PN leader Simon Busuttil was wrong to have appointed her and her former MEP colleague Roberta Metsola as shadow ministers. I still cannot understand how Simon Busuttil could first be regarded by Nationalists as the hero who, together with Eddie Fenech Adami, took Malta into the European Union, and then never be able to be seen as a good leader for the party, and for the country too. The two issues required different skills, and it is clear that while Nationalists saw him as having what was needed for the EU membership run-up, and afterwards gave him so much support in European Parliament elections, they never fully accepted him as the man who could turn things around after the 2013 debacle. I’ve heard too many Nationalists say that, with Busuttil at the helm, the party was never going to make it. They were right. Busuttil will go down in history as the first Nationalist leader not to have ever been elected Prime Minister since the first legislative elections in 1921. In the greater scheme of things, and with the benefit of so much hindsight, it could be argued that Simon Busuttil jumped the gun. He should never have accepted to replace Tonio Borg as PN deputy leader on the eve of the 2013 election, at a time when it was clear that the party was heading towards defeat – and what a massive one it turned out to be. He would have been in a much stronger position if he had refused Lawrence Gonzi’s overtures, and then be elected leader in the aftermath without having had a connection with the 2013 defeat. But, as things happened, he was already under a cloud when he became PN leader, and he was never capable of shaking it off. Added to this, he made several mistakes which came back to haunt him. He ignored the input and sacrifices made by some top party members, right until the last moment, when proposals made by shadow ministers and spokesmen were left out of the election manifesto while including others without their consent. He defended people who did not deserve it and distanced himself from others who had shown him loyalty, but who were discarded at the first opportunity. He was too hard-headed and surrounded himself by a restricted group of people, listening only to them. These same people, some of whom were incompetent for the tasks assigned, may not have had his best interests in mind. Simon Busuttil’s mistake was that he only went halfway, and he wasn’t strong or aggressive enough when delivering his message. Regrettably I cannot but disagree with Dr Simon Busuttil’s position. … The only social reality that the Nationalist Party is ignoring, is the reality of its own voters, who in the main are against the position being taken by the PN by a vast majority. Please stop and listen. There are many of us, beyond the numbers you seem to have decided to term insignificant. the PN change of policy was not the result of an open debate, but a leadership imposition when Simon Busuttil decided out of his own accord to push the Party in that direction. … Why an outgoing Leader keeps insisting on wanting to impose his opinion to the exclusion of all other baffles me. In a statement this morning, the Chamber of Advocates appealed to whoever had influence on public opinion to hold back from making comments on the judiciary. The chamber said it is highly concerned about what the Opposition Leader said, as it throws bad light on the independence and impartiality of the judiciary. The Opposition Leader should use all legal means to challenge any member of the judiciary but it is not correct that he speaks in public the way he did, the chamber said. His comments are meant to put pressure on the judge in question and exceed all limits of responsibility, it added, calling for their withdrawal. Outgoing Opposition Leader Simon Busuttil is messing up since he resigned the post after the general election and taking on the role of interim leader he is replaced in September, Frank Portelli, one of the candidates contesting the PN leadership, said. In a lengthy Facebook post, Mr (Mario) Galea panned Dr Busuttil's "authoritarian" style, said he should now "be quiet" while the party picked his successor and claimed unnamed "prima donnas" with no political experience had been allowed to hijack the PN. He called on Dr Busuttil to follow in his predecessor's footsteps and quit his parliamentary seat once a new leader was in place Doing so, he said, would ensure Dr Busuttil did not "remain in the shadows" of the PN's new leader. The real tragedy is that Simon Busuttil is going to remain a backbencher and thus will continue to control the party. He does not wish to leave the party. On this point, I am with Mario Galea. He should leave, as this will lead to a dangerous political situation. … All those who therefore wish to carry on defending Simon Busuttil, despite his despicable behaviour towards conservative voters within the party, are going to make the situation within the party more untenable. The interim leader (Dr. Simon Busuttil) is weak. 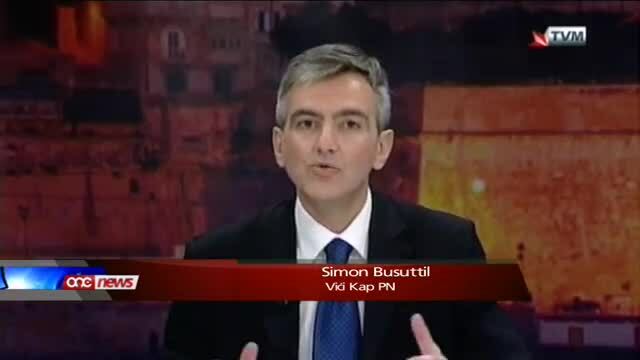 Simon Busuttil’s political personality has collapsed without any dignity. Busuttil is appearing more and more a leader with no backbone. His reactions after the electoral defeat and the manner in which he is acting shows that he has no determination. 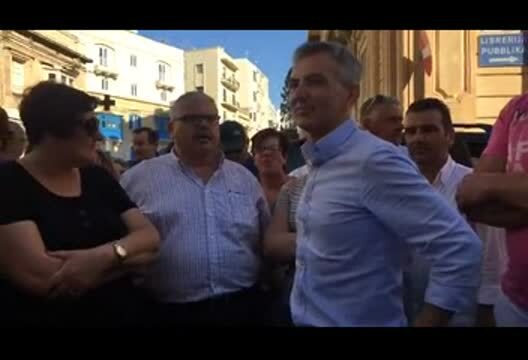 … The truth is that Busuttil does not have the fibre to assume responsibility for the defeat. … Unfortunately, the outgoing leader is a bad loser and has turned out to be a dangerous liar. The truth is that Busuttil is now desperately clutching to straws. Instead of being a principled leader, Busuttil chose to abandon party principles for a lucrative post. This is why, when he now speaks of rightousness, he cannot be taken seriously. He has lost all credibility. Adrian Delia asked for disciplinary action to be taken with urgency against outgoing PN leader Simon Busuttil and other members of the party leadership. … In his letter, he said Dr Busuttil’s remark following the meeting of the council was meant to sling mud at his candidacy. He objected to the clip of Dr Busuttil making the comment, saying it was abusive and should not have been posted on Facebook. … Dr Delia asked the electoral commission to verify whether the Facebook clip had been sponsored by PN funds and also asked it to publicly condemn Dr Busuttil’s comments. ‘A leader is a dealer in hope.’ That is where Simon Busuttil’s leadership failed. Integrity and honesty – as always mixed with a dose of hypocrisy – do not inspire hope. That is why his leadership was a complete failure, increasing the PN’s vote deficit from 30,000 to 40,000 and losing two seats to a parasitic political setup that managed to dupe him. Hermann Schiavone, il-membru Parlamentari Nazzjonalista li huwa sostenitur kbir tal-Kap tal-PN Adrian Delia, jinsisti li Simon Busuttil għandu jirriżenja mill-Parlament. Screen shot li ħa Newsbook.com.mt turi ċar li Schiavone kien ir-raba’ wieħed li vvota biex Busuttil jirreżenja mill-Kamra tar-Rappreżentanti. The outgoing leader (Busuttil) remarked that if he had been in this candidate’s (Delia) shoes he would withdraw from the leadership race. It was a very poor remark and showed a lack of firmness. The Malta Infertility Network has said that Nationalist MP Simon Busuttil’s comments regarding IVF law changes in Parliament yesterday - where he voiced his views against embryo freezing, and surrogacy - hurt many couples who are experiencing infertility. The honourable thing would have been for Busuttil to do what Lawrence Gonzi did before him, and also resign from Parliament after the 2017 election disaster. In spite of losing the 2017 election with an even bigger margin than four years earlier and leading the PN to its worst ever defeat in history, Busuttil felt that he should remain as an MP, and there is no doubt that this situation contributed to more division than unity within the party’s internal structures. What Busuttil is saying jars heavily with what his leader stated when the Egrant conclusions came out - that the PN has full faith in the inquiring magistrate and that it respects the conclusions of the inquiry. It is almost certain that Busuttil’s Parliamentary speech was not sanctioned by the party leadership. The former leader is repeating his previous mistake – that of leveling wild claims against the Prime Minister without being able to back them up with evidence. While parts of his argument might make sense, the fact remains that the inquiry did not find any proof that the elusive Panama company belonged to Joseph and Michelle Muscat. Without proof, claims remain just that - claims. The Egrant inquiry conclusions were a great embarrassment for Busuttil and the Nationalist Party in general, and harping on about the subject will only make Busuttil look like a stubborn politician who refuses to accept the result of a protracted inquiry headed by a respected magistrate. When Busuttil first made the claim on Tuesday, Adrian Delia, sitting a few feet away, looked bewildered and embarrassed. He defended Busuttil – he simply did not have any other choice. Delia was not in the chamber when Busuttil spoke again on Wednesday, in fact most MPs were absent, but a Nationalist MP who is close to the Delia clan, Hermann Schiavone, came out on Facebook to distance the party from Busuttil’s claims. What happened in Parliament on Wednesday further exposed the huge rift within the Nationalist Party. We have noticed that the Nationalist Party media has not given any coverage to the latest developments in court associated with Simon Busuttil. We have also noticed that the PN has issued a series of press statements since the court decision was made public, but none of them has been about the ruling, let alone in support of its former leader. The PN's total absence and silence on this front exposes a party that does not want to have anything to do with Busuttil's stance on this matter. It can be interpreted as a sign that the PN does not agree with what Busuttil is doing. Busuttil's own relations with the new leadership have been strained since before Adrian Delia's rise to the party's top spot, and continued afterwards, not least after Busuttil insisted that he retains his seat in Parliament and later after the publication of the conclusions of the Egrant inquiry. The fact that the PN and its media have ignored this week's events concerning Busuttil and the court decision reinforces the idea that the party wants to keep its distance from its former leader, at least on this particular issue. It is unlikely that the party will intervene - publicly or privately - to stop Busuttil from continuing on the road he has taken. What is clear is however that the party does not want to be seen anywhere near its former leader on this matter.